It has been confirmed that contractors will be in Spindle Tree Rise off Stroud Avenue on the 10th April to finish off the works to the road surface bringing to a successful close a long standing battle on behalf of residents by the Short Heath Lib Dem Focus Team reports Lib Dem councillor Doreen Shires. 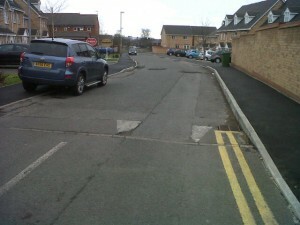 The development was built some five years or so ago since then residents, through the Lib Dem Focus Team, have been battling to get the developer to bring the roads and footpaths up to a standard which will enable the road to be adopted by the Council. Dogged persistence by Doreen and her team achieved a break through in December 2011 when the parent company of the developer Harron Homes (Midlands) agreed to complete works on the site. Since then contractors have completed kerbing, edging and footpaths in preparation for the final surface going on. The works should be completed by the 11th April.